A provincial market foray yielded some nice fresh off the vine but older (chronologically) patani or lima beans, so I blanched them and peeled the tough outer pods. I dressed these in good olive oil and some salt and pepper and added them to a salad of butterleaf lettuces, ripe tomatoes, some grilled red peppers and drizzled this with a mustard vinaigrette. Yum. Overall a “softer” salad as opposed to the often attractive crunch of a romaine or cos based salad. If you are wondering what else to do with the seasonal bounty of patani, try this spread I did years ago that was both intensely attractive and absolutely delicious. hi! new here and just stumbled in, looking for some recipes. i’ve read some of your posts and i find it very interesting and entertaining. in fact, i love it! sad thing is, finding asian or other exotic ingredients here in germany is pretty tough. if and when i do find what i need, it costs an arm and a leg. that goes for the seafood, as well. the gastronomie here is quite limited, as i’ve noticed. a couple of my gripes i have here, and a few things i miss about the states. but i still enjoy and love living here. ps: love your dog. she’s a cutie! please give her my biggest hug. Wow! The colors look really appetizing and refreshing! 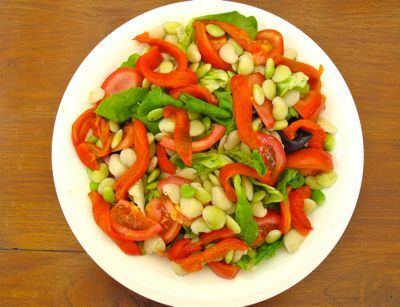 Perfect salad to munch on a super hot day. I’m really glad you’re posting a lot of veggie recipes these days in time for Lent.Thanks MM! tintin, arugula is a kind of green, slightly peppery and bitter but very good, I did a post on it here. Here’s another post on “wild” arugula. And in case you were curious about days old arugula microgreens, you can read this post. Hi tintin, if it is a salad recipe I’ll substitute it with baby spinach altough they don’t taste the same but it works for me. You can normally find aragula leaves at the salad greens sections. it also taste good as a topping on a crispy thin crust pizza or a burger. aha! lima beans pala ang patani! :) ngayon ko lang nalaman. hehe. Tintin: Oregano is an herb with a distinct taste and aroma…not peppery at all. Arugula is a salad green ….you can sub maybe Rapini…it is a much like a slimmer broccoli…it has a hint of bitterness to it and cut the rapini into 2 inch lengths…..how about dahon ng ampalaya? Just add apinch of chili flakes! I REMEMBER MY MOM COOKING FROG LEGS WITH SOTANGHON AND LOTS OF FRESH YOUNG GARLIC AND LIMA BEANS, SPRINKLED WITH FRIED GARLIC AND FRESHLY GROUND BLACK PEPPER.LAST TASTED 41 YEARS AGO BUT I CAN STILL REMEMBER HOW IT TASTE, OMG , LIMA BEANS IN BULANGLANG NA PAAYAP ( LIKE SITAW, BUT SHORTER ) ANG SMALL TARO ROOTS AND DRIED SHRIMP (FROM LAGUNA DE BAY ). 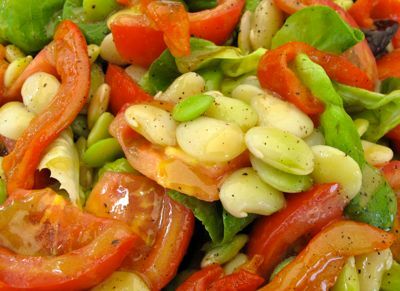 Hello, I was just wondering if Lima beans are available in Baguio all-year round (seeing that it prefers a cooler weather) since I can’t find patani here in manila at this time of year. Thanks in advance! Aby, I find patani is seasonal in Manila or the lowlands… but I am not sure if you can get it in Baguio all times of the year. Dear Marketman, I am an indian, pure vegetarian, who will be visiting philippines[san hose] in april,2011 for 15 days.Please let me know what all food items I should bring from India and what grocery is available in Philippines.Thanks.Mani . Mani, there are a few indian food stores like Taj and others on U.N. Avenue that stock ingredients. There are also several markets and groceries with vegetables and non-meat options. But if you are based outside Manila, you might want to bring a supply of essential spices, some legumes like lentils, etc. if you won’t be in the city often. A buffet for 200 ?! ?